I'm floored by the sheer volume of reports I get about the Florida school killings. At every moment there's another report, another angle. Some are just beyond the pale, For example, the Washington Post just reported that the Trumpies see it as a reprieve from all the negative press they're receiving. Can you imagine how bad things must be that a mass murder looks good to them? Naturally, you get the bought-and-paid-for GOP Senators offering thoughts and prayers, and saying that now is not the time to talk about fewer mass murders. And Trump, who took $30 million from NRA, doesn't talk about stopping assault rifle sales until we figure out what the hell is going on, because that kind of talk is reserved for Muslims. 90% of Americans support expanded background checks for guns. NRA, flush with cash, buys its way around us. Walter Mosley has a great piece in the Nation about how it's commonplace to buy your way around democracy, and how $2000 bought him political access unavailable to most of us. Yet GOP flunkies like Paul Ryan say the same thing time and time again. Let's not rush into things before we have the facts, Let's not have a knee jerk reaction. And time and time again, we do nothing. But then you see Emma Gonzalez speak, and you know she and her classmates can't be ignored. They were there. They're not accepting thoughts and prayers, or the nonsense that passes for caring. And they cannot and will not go away quietly. When your children act like leaders and your leaders act like children, you know change is coming. And indeed there is truth to that, as our ostensible leader, Donald J. Trump, is all over the place frantically blaming everyone but himself. You know, it's the FBI's fault. They're so focused on whether or not Russia swayed our election that they missed this. And most importantly, it's not his fault. If children were murdered it isn't his fault. If Russia bought the election it isn't his fault. He blames Schiff, Clinton, Obama, the FBI, life, the universe, and everyone and everything but himself, at one point putting forth the juvenile, "wasn't I a great candidate?" question. You know, I'm frequently in our department office when the supervisor is out. Kids come in, having been booted by their teachers. I ask, "Why are you here?" They say, "I don't know." I ask, "What did you do?" They say, "Nothing. The teacher is crazy." After a little digging, things generally appear a little more complicated. 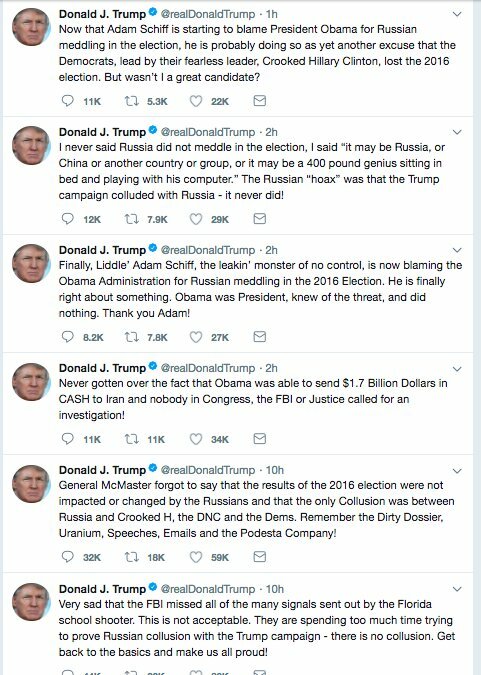 Make no mistake, the President of the United States is that child, crying that he didn't do anything and that nothing is his fault. 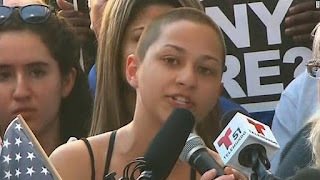 And Emma Gonzalez is the voice of truth. Her voice is so powerful that even bought-and-paid-for Donald Trump is now paying lip service to actually doing something. But Emma and her classmates will not be bought off with trinkets, and they aren't going away. Nor is the FBI. Nor is Mueller. The kid in the office isn't getting away clean, and neither is the juvenile at the White House.